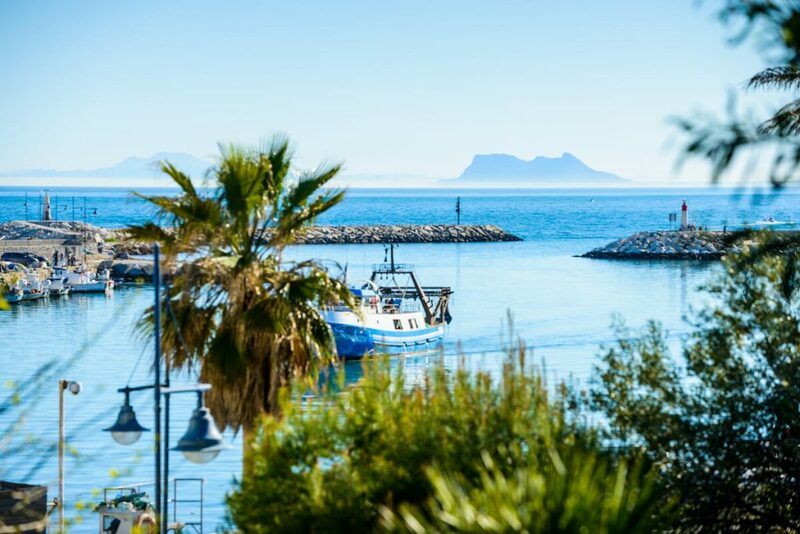 Estepona has grown considerably in recent years, from a small fishing village to one of the most popular holiday resorts on the Costa del Sol. Thirty kilometres to the west of Marbella is a 21 kilometre long beautiful stretch of coastline, protected by the impressive Reales mountain range. This coastline is known as ‘The New Golden Mile’. 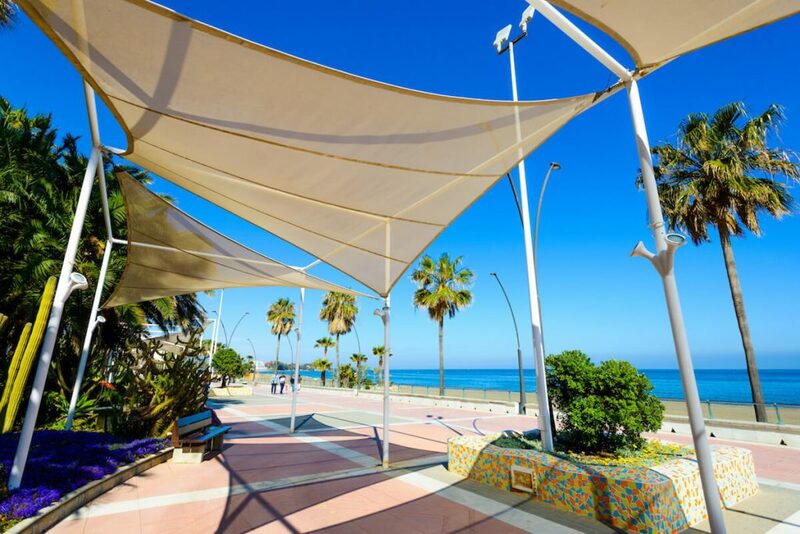 In recent years, a number of changes have taken place, which makes Estepona stand out from the rest of the touristic towns on the Costa del Sol. 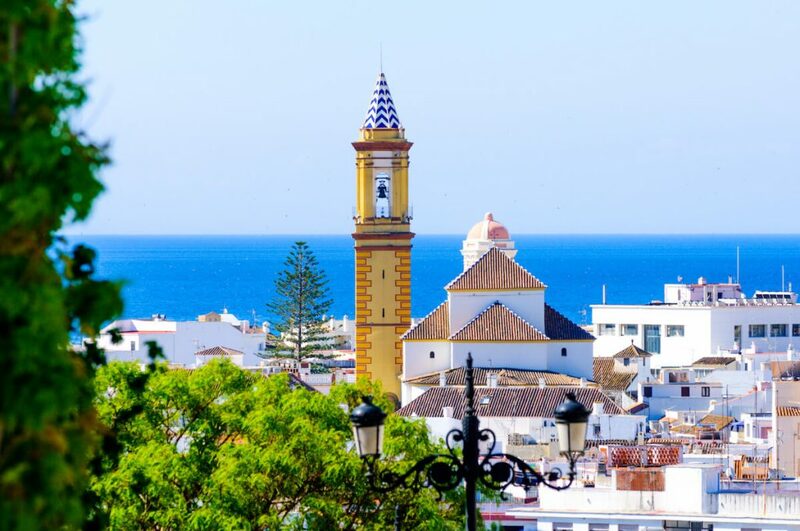 The mayor of Estepona, José María García Urbano has worked hard to revitalize the centre and has given residents the opportunity to help rejuvenate this beautiful, family-oriented city. If you walk through the streets, you can hardly ignore them, the beautiful matching coloured flower pots full of scented geraniums, mostly placed in the small residential areas in the old town. Each street has been assigned a colour or pattern; the uniformity is particularly striking. Many of the streets have been restored, the facades have been repainted. 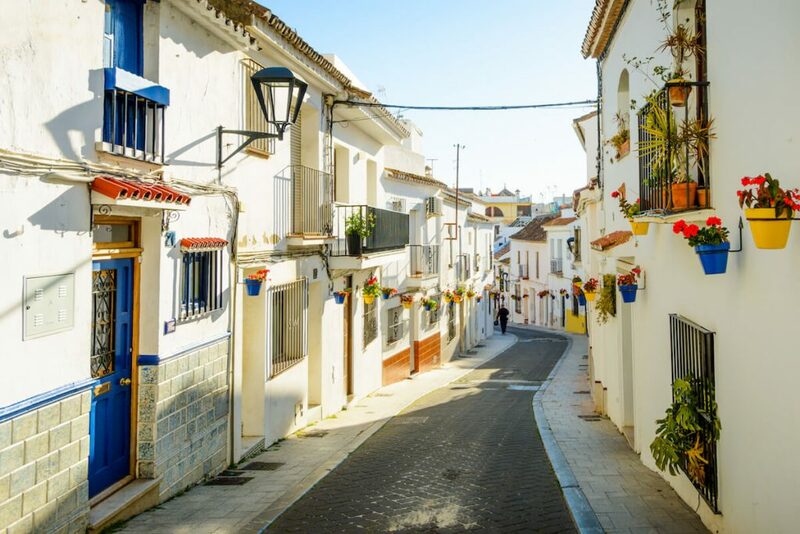 The visual facelift of Estepona is remarkable and noticeable every corner you turn. Murals have played an important role in the rejuvenation of Estepona, where the facades of a few high blocks of flats have been brightened up. 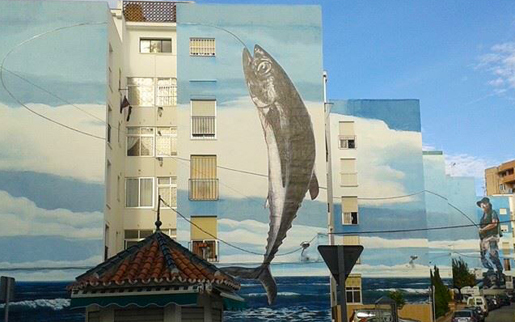 Follow the “Mural Walk” (La Ruta de Murales Artísticos) and admire the works “House of the Good People”, “Fishing Day”, “Watering the Garden” and much, much more, created by local artists and professional wall painters. In addition to this, two important cultural attractions were added to the city in 2015. The “Orquidario“, or Orchids Park, and the Botanical Garden are housed in an impressive, specially designed building, consisting of three glass domes. This adds a whole new dimension to the skyline of Estepona, while within this beautiful building 8,000 different types of plants are exhibited, around a breathtaking waterfall of 17 meters high. More than 35,000 people visited the Orquidario in the first week, and the first celebration of a wedding took place only two weeks later. There are 5000 plants and 1.300 species and these have been carefully selected so that visitors will be sure to see beautiful flowering displays no matter what the time of year. It is claimed as the biggest collection in Europe. The orchid house received 100,000 visitors in its first year however it is quieter when a small admission charge was introduced in the second year. The gardens were named after Baroness Carmen Thyssen in March 2018. The best way to describe the New Golden Mile is luxury. You’ll find the best hotels of Estepona here, some of the most exclusive properties, many tropical gardens, exclusive restaurants and shops, and probably the most beautiful beach promenade on the Costa del Sol. A large percentage of Estepona’s developments of luxury homes take place along the New Golden Mile. Designed to mimic Marbella’s iconic Golden Mile, and perhaps one day considered the western extension of the original. The majority of the Real Estate on the New Golden Mile have been placed in attractive complexes with mainly apartments and luxury villas. Especially the new build villa projects are designed to attract visitors from Nordic and Arabic countries to the Costa del Sol. Much attention is paid to facilities and local amenities and the prices of the projects range from affordable to pricey, but almost all within walking distance of the beach, enjoying beautiful sea views. The New Golden Mile is, since 2015, the heart of new build projects on the Costa del Sol. Areas like La Resina, Selwo and Velerin are widespread and offer plenty of unspoiled land for new property developments. In these areas, the majority of luxury villas and apartments for sale are south-oriented and many enjoy breathtaking, panoramic views of the Mediterranean Sea. The evolution of Estepona does not seem to show any signs of slowing down. The enthusiasm continues to grow with every new opening and the city is expanding successfully. The positivity is contagious; more and more investors are looking for an expansion in the new pearl of the Costa del Sol. Together with the increasing tourism, the local economy is strongly stimulated, so there is even more opportunity to grow and perhaps, one day, peer wit hits larger bother Marbella. Are you looking to buy a luxury residence on the New Golden Mile, Estepona? 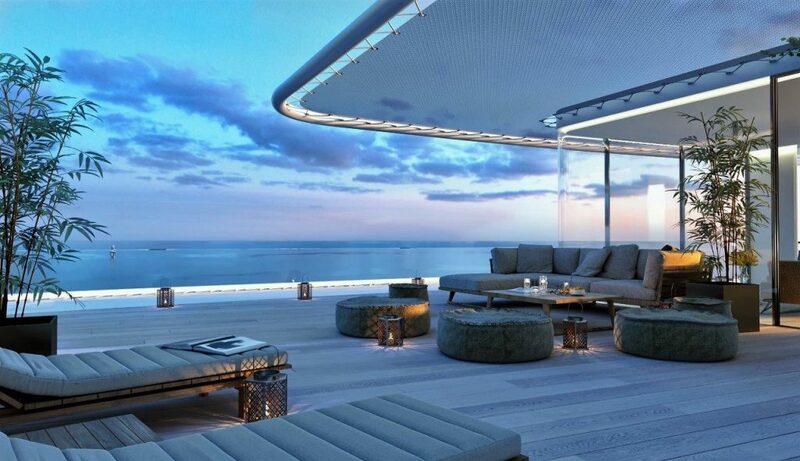 An apartment, penthouse, luxury off-plan villa with or without sea view? Cilo Marbella is the luxury property expert for Marbella and its neighbouring areas. We have all the luxury properties on the New Golden Mile in our portfolio. The New Golden Mile is located only a 49 minutes drive from Málaga airport, 11 minutes from Puerto Banus, 21 minutes from Marbella. Where is the New Golden Mile? New Golden Mile is the name given to the area that lies between Estepona and Guadalmina. Why is it called the New Golden Mile? In reality, it is only a name that is used for marketing purposes. It is actually a “borrowed” name of the original Golden Mile, which lies between Marbella and Puerto Banus. Do we take the New Golden Mile too short ?! Absolutely!! This zone is made up of various independent urbanisations. Partly situated on golf, or on the beach or a bit further inland. The A7, the former n-340, is the vein that connects these urbanizations. Are there any golf courses on the New Golden Mile? Well-known golf courses on the New Golden Mile include; El Paraiso Golf, Guadalmina Golf, Atalaya Golf, Resina Golf and Los Flamingos Golf. The golf courses are surrounded by luxurious villas and the most modern apartments that can be found here on the coast. Does the New Golden Mile feature tourist attractions? Selwo Aventura is one of the biggest tourist attractions on the Costa del Sol. A wonderful day out for the whole family! Definitely recommended when it is a little less warm one day. An unforgettable day out.